Shopping for your baby’s first car seat is head spinning. The types! The styles! The cool colors, such as “blackberry,” “night” and “sand”! To save your sanity in the car seat aisle, here’s a smart and safety-minded shopping strategy I suggest that can narrow the field considerably: Choose an infant car seat with a load leg. A load leg, a.k.a. a foot prop or stability leg, is a popular feature on European car seats and fortunately, it’s gaining ground in the U.S. too. If I were doing it all over again, I’d definitely checkout an infant car seat with a load leg. What is a load leg? A load leg is a steel-enforced rod that’s attached to the infant car seat base. It affixes the infant car seat base to the floor of your car. After you install the legged base, you kinda forget about it. But if you ever get into a crash, the load leg hunkers down. It provides added stability in a front collision. In that type of crash, which is the most common, government safety standards allow an infant car seat to rotate downward up to 73 degrees. (Picture a rear-facing infant seat rocking forward, toward the back of a car’s front seat.) “But we really don’t want the car seat to move at all,” says Bob Wall, a car seat safety technician instructor and the global advocate for Wonderland Nuna, in Middletown, Virginia. According to Nuna’s internal testing, a stability/load leg helps keep a car seat planted by distributing the force of a crash by up to 90 percent. Crash forces get diffused through the seat and the frame of your vehicle, to help keep the seat fixated, which protects your baby’s head and spinal cord from injury. “The less motion, the better for your child,” Wall says. The safety back story: All car seats sold in the U.S. must meet Federal Motor Vehicle Safety Standard (FMVSS) No. 213, which protects your child in the event of a front collision. U.S. car seats must provide this baseline of safety. Car seat manufacturers “self-certify” to meet FMVSS 213 by doing their own in-house testing. The National Highway Transportation Safety Administration (NHTSA) conducts spot checks. They’ll buy brand new seats off store shelves and test them in their own facilities to make sure seats are compliant. Although there’s no U.S. federal safety standard for the load leg, car seats with a load leg are tested to meet FMVSS 213 with and without the load leg. Nuna Pipa. It’s just 7.7 lbs without the base. It’s one of the lightest infant car seats on the market, which make toting around your tot a lot easier. The Cybex Aton 2, Aton Q, Cloud Q (which reclines flat, turning the seat into a carrycot) and GB Idan infant car seats offer linear side-impact protection (L.S.P.) system. L.S.P. is designed to absorb more of the energy of a side-impact collision, which is less common than frontal collisions but often more deadly. 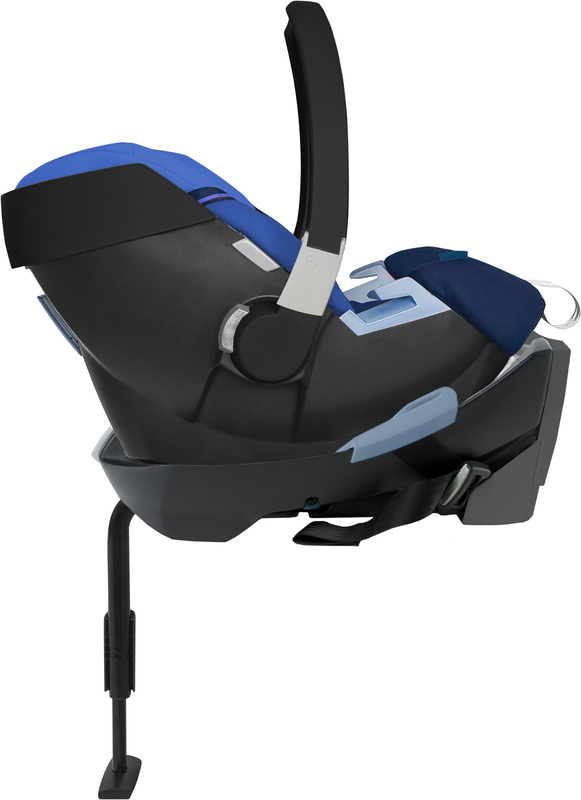 The innovation is a small plastic wing on both sides of the car seat, which you’ll engage if your child’s car seat is installed in the outboard, by-the-door positon. Cybex car seats are compatible with the Cybex Balios M, Iris M-Air, Agis M-Air 3 and Agis M-Air 4 strollers as well as the GB Pockit+ and GB Maris strollers (the Pockit+ and Maris be on the market February/March 2017). GB Idan will be compatiable with all Cybex strollers and the GB Maris stroller. You can also use the Aton 2 as a travel system (car seat + stroller) using Maxi-Cosi adapters with these strollers: Baby Jogger City Mini, Baby Jogger City Mini Double, Baby Jogger City Select, Quinny Buzz and the Quinny Moodd and Stokke Xplory. The GB Asana35 is compatible with the Pockit+. Bonus! The GB Qbit+ folds compactly = great for travel. The GB Asana is compatiable with the GB Qbit+ stroller. Nuna Tavo (no adapters need). Nuna IVVI; you’ll also need Nuna Ivvi car seat adapters or car seat ring. Good news! They come with the Nuna Mixx and the IVVI. Nuna MIXX; you’ll also need a car seat adapters but they come with the Nuna MIXX. Nuna has also partnered with Stokke. Its Stokke Pipa by Nuna car seat can be used with any Stokke stroller without an adaptor, including the Stokke Xplory and Stokke Scoot. Overall, there are lots of safe car seats on the market. If you decide to go the load-leg route, you’ll pay a premium for its added features. Put it on your baby registry. If you’re paying the tab yourself, watch for a sale. Bottom line: Consider an infant car seat with a load leg a good investment in your baby’s safety. I have read a lot online and still cannot find the answer 🙂 if by any chance you know, can you tell me what car seats brands the Cybex Priam is compatible with ? I’m expecting a child soon and I want to make a travel system. I really like Nuna Pipa 2016 infant car seat and 2016 Baby Jogger City Mini 3w single. Your website shows that it is compatible but I’m unable to find the adapter to make it work. Can you please share a link where I can buy the adapter to make it a travel system. Is the “stokke pipa car seat by nuna” compatible with the nuna mixx? The Stokke Pipa car seat by Nuna is compatible with all Stokke strollers (no car seat adapters needed). But it’s not compatible with the Nuna Mixx. The basic Nuna Pipa (not the Stokke Pipa) infant car seat is compatible with the Nuna Mixx. Would it be possible for you to have a link to all 16 of the strollers that the Nuna Pipa is comparable with? I clicked on the link and it takes me to the Nuna european website which does not list any others than their own strollers. Which I love but they are just slightly out of my price range. For example can you use the Cyber M series with the Nuna Pipa? Just a note – since I found this out the hard way – the Stokke Xplory is not actually compatible with the Aton 2, only the Q. The adapter is too wide to fit into the slots on the carseat all the way. Thanks Max! I made that change. So helpful! I will be adding even more to this post as new strollers and infant car seats roll out for 2016.